I’ve thought long and hard about writing this review. We lead fairly hectic lives and always try our best to get 4-5 days away in February. This year we found we could get a week away so rather than ski we decided sun / warmth was on the agenda. This hotel came as a personal recommendation. Admittedly the weather was a little hit and miss when we stayed but from the outset the hotel seemed a little flat & lacked what we thought “a personal touch”. The one area which was superb was the spa I had possibly one of the best massages I’ve ever had (and I’ve had a few). The food was ok, the staff “fair to middling” (for each smiling person there were two that were less so) and just the little things you would expect from a hotel of so say “such high standing” - they were missing. 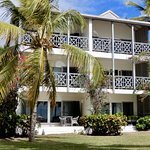 We have been lucky to stay in some very spoiling places which would easily surpass Carlisle Bay. Our room was very comfortable but the bath tub which was to die for (it was enormous) took 40+ minutes to fill only a couple of inches. I asked nicely, not once, not twice but three times if it could be looked into. It took 36 hours for someone to do so (and by then I had rattled senior management) and it was fixed within a matter of minutes. We had...I’ve thought long and hard about writing this review. We lead fairly hectic lives and always try our best to get 4-5 days away in February. This year we found we could get a week away so rather than ski we decided sun / warmth was on the agenda. This hotel came as a personal recommendation. Admittedly the weather was a little hit and miss when we stayed but from the outset the hotel seemed a little flat & lacked what we thought “a personal touch”. The one area which was superb was the spa I had possibly one of the best massages I’ve ever had (and I’ve had a few). The food was ok, the staff “fair to middling” (for each smiling person there were two that were less so) and just the little things you would expect from a hotel of so say “such high standing” - they were missing. 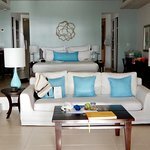 We have been lucky to stay in some very spoiling places which would easily surpass Carlisle Bay. Our room was very comfortable but the bath tub which was to die for (it was enormous) took 40+ minutes to fill only a couple of inches. I asked nicely, not once, not twice but three times if it could be looked into. It took 36 hours for someone to do so (and by then I had rattled senior management) and it was fixed within a matter of minutes. We had an “incident” too which interestingly the hotel management did not want to address in the slightest. We were not wishing to pursue it but when I suggested we would, the doors slammed shut and the small amount of charm evaporated very quickly. 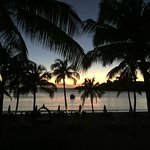 Thank you for your review of your stay at Carlisle Bay. I am sorry that we did not deliver the experience that we should have. I understand that there were issues that were not resolved, my sincere apologies. I have sent you a direct message and would be very grateful if you could let me have a little more detail on this so that I may address it. 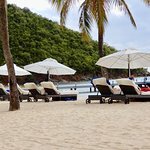 Almost without exception The Carlisle Bay is a truly great hotel. The setting is lovely. The views correspondingly spectacular. The sunsets delightful. Service is good too. The suites are spacious, well equipped and attractive - plus RIGHT on the beach. We eat in three restaurants and the food was good, particularly in East. When we were there a Russian oligarch came to visit with his six staff. A novel experience to watch their interaction. We would happily go back; enough said. What a pleasure to read your review, thank you! We, as a team, are thrilled to read that you enjoyed your stay and delighted that you think you may come back one day. We certainly hope we are able to welcome you back at some point - we cant promise oligarchs but we do promise our warm and sincere service. 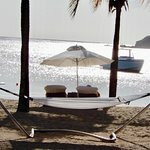 We had a wonderful holiday at the Carlisle Bay in Antigua. The room was beautiful, the staff kindly remembered us from the previous year's visit and made us very welcome. The lobby and bar are beautiful and the kids club is excellent. The food is delicious although sometimes the breakfast can take a little while as the restaurant got pretty busy at 9am. They take great care about dietary requirements. The beach is beautiful and you can rent kayaks and paddleboards, and when it is working, a pedalo. It wasn't when we were there unfortunately. The only irritation came when we went to the watersports hut to hire kayaks. The guys there were an exception to the usual standard of interested and committed staff. It took a while for them to acknowledge our presence and there was a distinct lack of the charm and politeness that we had experienced elsewhere in the resort. They did help us but it wasn't a pleasure to interact with them. This was the only disappointment in an otherwise lovely stay.